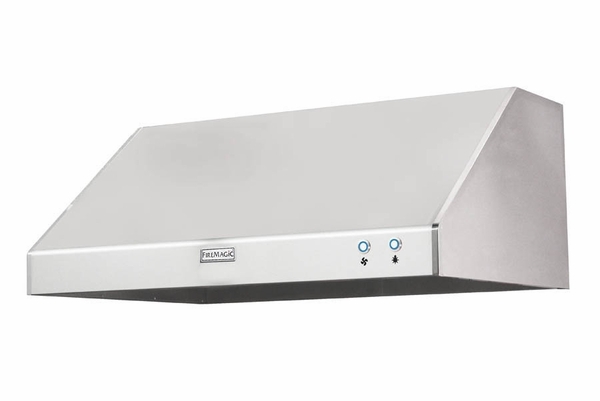 This large hood can be installed over any Fire Magic or American outdoor grill. It is made of 304 stainless steel and has seamless edges. It is powered by 1200 CFM blowers that remove excess heat and smoke from your covered patio. This model comes with two LED lights for use at night and Blue Bezel illuminated push button controls. It is UL listed for both indoor and outdoor use and has an innovative low voltage operation. The anodized aluminum filters are dishwasher safe. Mounting brackets are included. The hood's dimensions are 60" W x 18" H x 30" deep. WARNING: Cancer and Reproductive Harm. For more information go to www.P65Warnings.ca.gov.